When your job requires you to wear hazard specific clothing to protect you from various risk levels, including FR Clothing or Switching Gear, you also require hazard specific Fire Retardant ArcSafe Wet Weather Gear to complete your protective garment system. Workers in the electrical industry are often exposed to hazardous and potentially dangerous workplace conditions while working outdoors in the rain. The Zetel ® ArcSafe wet weather apparel was specifically developed by Elliotts to provide Australia’s leading solution for the protection of workers against electric arc flash in wet weather conditions. The performance of the Zetel® ArcSafe fabric has also been improved. Modifications to the components and construction has improved the ATPV rating from 8.9 to 11.0 Cal. Zetel® ArcSafe wet weather Jackets and Trousers have recently been tested by Kinetrics Laboratory in the US to ensure they meets the highest possible standards required by Electrical workers. The ArcSafe Jacket and Trouser showed no failures in the test results and provided solid feedback on the garments that they are the best Arc Flash wet weather gear available in Australian Market. ArcSafe Wet Weather gear is available in two levels, the first being ArcSafe Wet Weather that provides a HRC 2 level protection in a full waterproof wet weather jacket and trouser. The second being ArcSafe GR FRAS (Flame Retardant Antistatic) which is the same ArcSafe material with an interwoven carbon grid to provide antistatic properties to the ArcSafe Garment. ZETEL® ArcSafe Wet Weather Clothing offers increased hazard specific protective performance to address specific needs and hazards in the electrical utility industry for Australasian conditions. 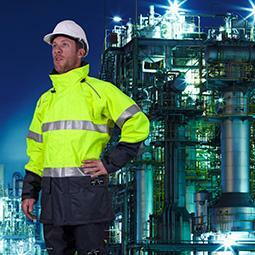 ZETEL® ArcSafe clothing is highly visible, waterproof, breathable, windproof, flame resistant and offers protection against electric arc hazards. Elliotts ZETEL® ArcSafe is a three layer, flame retardant, durable, breathable, waterproof and windproof fabric. ZETEL® ArcSafe offers electric arc flash protection of HRC2 (ATPV 11). ZETEL® ArcSafe conforms to the requirements of EN1149-3:2004 – Protective clothing electrostatic properties-surface resistivity. ZETEL® ArcSafe GR incorporates core conducting trilobial yarns which offer superior anti-static performance and durability. ZETEL® ArcSafe GR conforms to the requirements of EN1149-3:2004 - Protective clothing electrostatic properties-surface resistivity. Preview the Arc Flash test video online and see for yourself the results. Test data is also available for this garment by contacting the Elliotts Team on 07 32652944. The Elliotts Specialist ArcSafe Wet Weather gear offers options for all industries and protection levels required to keep safe in all wet weather situations.